An online exclusivity on Holt’s Cigar Company, the Trophy series is part of Pocky Patel’s Mulligans range. This very light and potentially creamy Connecticut shade cigar is often sold at heavily discounted prices, which makes it an attractive purchase. If you want to skip ahead, you can use the links above to jump down. The Trophy Series is part of Rock Patel’s golf-themed Mulligans range. Each of these cigars feature names such as Caddy’s Choice and 19th Hole so there’s nothing more appropriate for a day out on the course. Sold exclusively on Holt’s Cigar Company, Patel sought to use the Mulligans franchise as a platform for introducing his lesser-known but cherished blends onto the market. According to the retailer, over half a million cigars from the range have been sold to this date. As for the Trophy Series, it comes across as your classic Connecticut cigar, which is said to be reminiscent of Rocky Patel Vintage 1999. There is a variety of vitolas to choose from, which each carry a gold-themed name too. For instance, the Toro is referred to as a Slice whilst the Churchill is a Whiff. 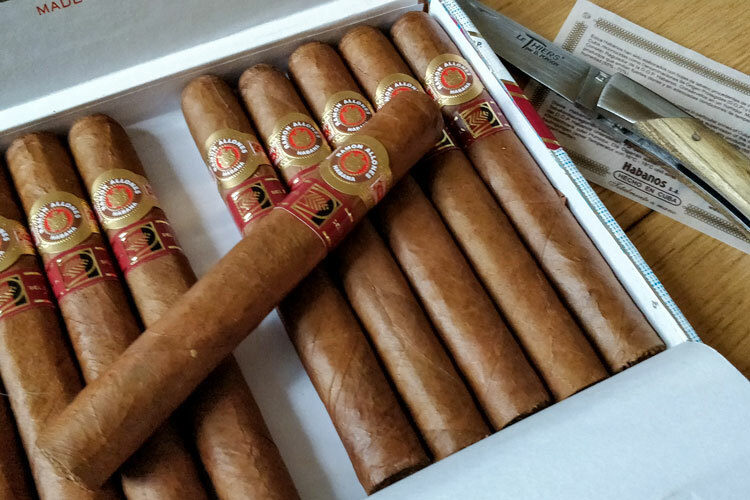 In this review, we’ll be testing several Hooks, which are the Robusto-sized cigars. The Trophy Series features a textured hue of light and dark tan colours as well as a few hints of green. Overall, the colour is chestnut and the green tint is only noticeable under direct sunlight. There are a few visible veins as well as the edges of the leaves. However, this isn’t particularly off-putting. As for the rolling consistency, it’s very even and the body gives a firm spring when pinched. Finally, the cigar’s aromas consist of barnyard and freshly-cut pine. As we note in every review, we ensure to provide a relatively accurate evaluation and recounting of our experiences. In order to do so, we will smoke two or three of the cigars so we can identify its most consistent characteristics whilst identifying any anomalies. After a cheeky snip, I tested the dry draw, which gave only a mild resistance. I also picked up some tasty cappuccino notes as well as some fresh wood chippings and a hint of caramel. The Mulligan Trophy Series starts off as an extremely mild smoke with very understated aromas. After about half an inch, there’s a build-up of flavour with some discernable notes. On the palate, I picked out some metallic copper and aromatic sage whilst the retrohale revealed the mineral clay taste of terracotta. Once well into the second third, the flavours begin to evolve to feature a more yeasty presence. I’d liken this particular accord to hot cross buns given the slightly sweet and glazed flavour that is reminiscent of raisins. Furthermore, there’s a slightly creamy texture so you could even go further to suggest that these hot cross buns have been toasted and buttered. Otherwise, there’s a hazelnut note on the retrohale as well as a consistently aromatic sage aroma. Once into the final third, I noticed that the yeasty and nutty flavours had somewhat subsided. However, I rediscovered the terracotta aromas from before that had returned with a much greater emphasis. Accompanying this was an overt note of fresh cedar whilst a slightly fruity red peppercorn came into play. I was quite surprised by this last note as it wasn’t peppery as such but provided a deep and aromatic note on the palate. Retrohaling was a particularly pleasant experience throughout the final third as it gave a very mineral experience. The flavours of terracotta were extended by sensations of cool stones and moistened dry earth under the sun. I was quite satisfied by the Trophy Series’ consistently reliable burn throughout the smoke. The ash’s backbone was moderate, which allowed for a stack no longer than an inch and a half. Burn the burn was razor sharp throughout the majority of the smoke. In terms of burn temperature, it was slightly on the warm side but nothing uncomfortable and the draw gave a faint and pleasant resistance. Finally, the overall smoke time came to around 50 minutes, which is just as you’d expect from a youthful Robusto. Being an extremely mild cigar, the Trophy Series is best paired with beverages that aren’t too heavy on the palate. Whilst some younger Highland whiskies are indeed possible, I’d be more partial to a beer or cider in this instance. For instance, an ideal pairing on a hot day would be a Corona beer with a slice of lime given the zesty second third. Alternative, soft drinks and sodas are a fair choice and I’d consider a craft root beer. Otherwise, I enjoyed this cigar with a mild Manaresi Miscela Oro 90% Arabica espresso. Given that this is a very well-balanced Italian coffee blend, it doesn’t render cigars too bitter nor too intense for the palate. Available in heavily-discounted bundles of 20 cigars, these are very tempting to purchase in bulk to stock up on affordable smokes. Otherwise, they’re not sold as singles but could be picked up as part of the Rocky Patel Mulligans Sampler through Holt’s. The cigar features two bands. The first is dedicated to the brand and is written in a font that gives off Irish or Celtic connotations. Meanwhile, the second band indicates the range itself. I noticed that a few of the main brand bands tended to be applied with zealous amounts of glue, which made them challenging to remove. However, the first bands were very easy. In terms of pricing and the quality of the smoke, these do offer great value for money. Holt’s often sell them for 79% of MSRP, which means you can pick up a bundle where the individual cigars come to just over $2 each! When Should You Smoke A Rocky Patel Mulligans Trophy Series? I find that the Rocky Patel Mulligan Trophy Series to be a particularly versatile cigar that can be enjoyed during a variety of occasions. Nevertheless, I’d overall say that it’s a more casual smoke. Thanks to its very mild body and reliable construction, it’s ideal for the infrequent smoker for a hassle-free and easily enjoyable experience. For instance, it is indeed appropriate for accompanying you on the gold course with bunch of pals. Similarly, it’s a great cigar to share with friends in general whether at a barbecue or out fishing. However, I wouldn’t say that it’s a particularly formal cigar for special occasions so there’s no need to horde these! Although nothing spectacular, the Rocky Patel Mulligans Trophy Series is an overall pleasant something that won’t leave you dissatisfied with your experience. A very youthful and mild Connecticut, it features an enjoyable range of flavours and is the perfect choice for either infrequent cigar smokers or those looking for easy everyday smokes. "A Mild & Pleasant Connecticut. Whilst Mulligans isn't the most complex cigar, it's a reliably enjoyable experience with decent flavour." Sometimes it’s good to have an inexpensive go to smoke. I just checked holts.com and these are currently on sale, think I might buy myself a bundle. Great review. I’ve seen this one crop up a few times but never gave it much of a thought. I’ll grab a few next time I’m on Holt’s! Definitely worth a shot as they’re relatively inexpensive and provide a very pleasant smoking experience.